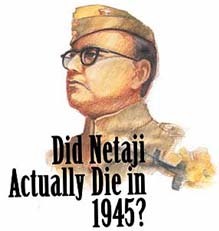 THIS refers to "Did Netaji actually die in 1945"? by V.N. Datta (August 19). The question of Netaji’s death, its time, date and place is only of academic interest. But what a shame that some unscrupulous elements raise the matter off and on for ulterior motives. It is an affront to the great hero to suggest that he ever hid and is still hiding to escape from the clutches of the British. Netaji was too brave a person to not take on the British headlong. A matter of practical interest is whether Netaji has been accorded the place and honour he deserves in the annals of the Indian freedom struggle. It is traumatic to find that while Gandhi’s impractical philosophy has been blown out of proportion, the roles of Netaji and of other revolutionaries like Veer Savarkar, Bhagat Singh, Chandra Shekhar Azad have been relegated to a mere footnote. Now when the country is plagued by many ills, the political thoughts of these heroes have assumed an added relevance. They are the leaders who ought to serve as role models for the youth of the country. Let us forget when and how Netaji died. Let us perpetuate his political philosophy and try to emulate his courage and sacrifice. If we follow Netaji, surely we will escape from the clutches of casteism, regionalism and consumerism. This is with reference to the article "Sionara...classroom" by Suchita Malik (August 12). Feeling redundant as a teacher is a phenomenon quite common in schools as well as colleges. Waning of students’ interest in studies has become an universal problem. The role of a teacher in a classroom has not changed to a great extent. With exposure of today’s generation to the marvels of technology, methods of teaching used are far from the reality. These methods have become redundant. If teachers want to perform their role in classrooms, they will have to adopt new methods which can hold the interest of the students. Otherwise, as the experience of the writer has shown, we will be able to make do with one or two student in a class of 30 or 40. The article "From gori to a gal" by Raman Mohan (August 12), was very well written and depicted the transformation from a gori to a gal exquisitely. At the college-going age, everybody craves attention and every way, other than academics, seems to be the most important way to hog the limelight. Simplicity is not at all acceptable. One has to be smart, thin/fit and modern. English is the language that is a must. Having a boyfriend or a girlfriend is mandatory. In their trying to blindly imitate city-bred, convent-educated girls, village girls end up being their physical replicas while they completely fail to match them on the academic and professional fronts. Then who bothers until the examinations draw nearer? Thanks to our educational system and the trend of repeating questions every three or four years, they easily manage to achieve their degrees with just one month of casual labour. This is where we provide them with rock solid justification for their foolish decision and they do not realise that there is something terribly wrong. This realisation dawns on them only when they come out of college and when they find themselves incapable of being a source of financial and intellectual support to their family by doing a respectable job. All they do, if at all, is to go in for receptionists jobs, where they are just exploited for their sweet, short and fluent English tongue and made-up looks. It was heartening to read the story of Pinky and more so because it’s the story of every other girl who goes to the city to study. The writer has successfully portrayed the feelings, emotions, and tumultuous changes all Pinkys go through in city colleges. It’s a pity that these girls get attracted to the fantasy world of jeans, short hair and boyfriends without realising that this is not going to last forever. Besides, they just get lured into it oblivious of the fact that it may not be good for them. However, what they don’t realise is that crossing over that thin line of decency between a boy and girl may have serious repercussions on their lives and is not something that one ought to be proud of. I don’t condemn boyfriends, but both should know their limits. Fooling one’s parents at the cost of enjoying oneself it not ethically right. College years may be the ones when such girls lead completely different lives, but once these are over, they have to face stark reality and get married and settle down in life. And the memories of those yesteryear continue to haunt them for the rest of their lives. The question that all these girls should ask themselves is "What will I do if my kids also do the same or worse when they go to city colleges? Will I be prepared to accept them as completely changed persons who think for themselves and have a life of their own?" Perhaps, we all know the answers. The writer has aptly depicted how simple ordinary village goris are dazzled and swayed by the fashionable life of big cities where they are sent for studies. It is a pathetic tale of the youngsters who are lost in the crowd of big towns and also lost to their simple parents of dusty villages. The new environment in big towns, the dress, style of life, way of living, diet etc present a contrast with the rural way of living. This creates a lots of stress, and conflict in the minds of young girls who often fall to bad company where they are led astray. This way it becomes very difficult for them to readjust in the rural setting. Life of simple village girls can be saved through proper moral guidance and vigilance by college authorities where they stay. Also parents should be alert and stay in constant touch with their wards. Let vigilance on our part be the price to be paid for liberty to all. This refers to the article "The fine art of tea tasting" by Shona Adhikari (Aug 19) wherein the writer gives a glimpse of the way experts perform the task of tasting tea and grading it. As far as the tea at the consumer’s end is concerned, its use seems to have become universal and almost ubiquitous. We find the people veraciously consuming the cups of tea irrespective of clime and country, sect and class. Looking at it from a humorous angle, we can say that just like the English language, it seems to have acquired the local hue in innumerable ways. The people all over have endeavoured to bend its taste according to their liking. While some people prefer to have the ‘separate tea’ in an elegant manner from the three-piece tea service, others want to boil the ingredients — water, tea leaves, milk and sugar — so thoroughly that it acquires a very strong taste. While some people want black tea, just boiled kahva, without any milk, others want to boil the tea leaves in pure milk. Moreover, we come across the variations of tea with flavour of ginger, tulsi leaves and other spices called herbal tea, besides the brand called ‘chocolate tea’ with a chocolate flavour. Still others concoct iced tea with lemon juice in it. Finally, by the time it is ready to be consumed, the cup of tea becomes imbued with the personal preference of the person preparing it. This refers to Taru Bahl’s "Being progressive has more to do with attitude" (August 19). Very often, being progressive and successful is interpreted as one’s ability to earn more money and lead a luxurious, rather an extravagant, lifestyle. Naturally, therefore, the people with modern gadgets, palatial homes, occasional lavish parties, tend to command appreciation of the people around. But the real and lasting success lies not in being able to mint money, nor in wielding influence on others. It is in one’s preparedness to repose confidence and faith in oneself. Real success is in one’s ability to be at peace with oneself and with the world around. It is in this aspect of life that modern man has failed. Man’s ruthless craze for money and material comforts only betrays his inner fear of insecurity and a lack of the sense of belonging. His very concept of happiness in the external world of sensual pleasures finally proves to be no more than a myth. No doubt money and material comforts are good and very often are essential ingredients of a happy contented life, but they are only a means to an end. One must attain a far-sighted, positive and balanced approach to life and its ultimate spiritual goal. A lop-sided priorities of human existence is the main cause of discontent.